Welcome to Williams Township, Dauphin County, PA! On the 7th of February 1869 the court directed the township of Williams to be formed from the township of Wiconisco. Williams Township is bounded on the east by the Schuylkill County line, on the south by Jackson Township, on the north by Lykens Township and on the west by Wiconisco Township. 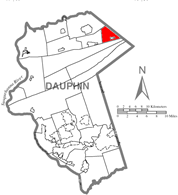 Although one of the smallest townships in Dauphin County, it is by no means the least important. It is the center of the Lykens-Williams Valley coal basin. Its early history and development of its coal interests are part of the history of the valley. ...will serve the residents, businesses and visitors of Williams Township by providing Municipal Government information, including a listing of elected and appointed officials, news about township events and activities, documents like Meeting Minutes and several other resources. Please be patient as the website grows and continues to be a work in progress. The area is now mostly residential. We are nestled between two mountains, which are mostly State Game Lands. The Williams Valley Jr.-Sr. High School is located in the township and is the largest employer at this time. Several recreation parks are utilized by the various youth groups and supported in part by Williams Township.